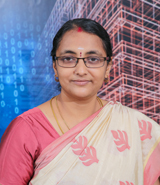 The Department of Computer Science and Engineering focuses on building a strong foundation in the basics concepts like logical thinking and programming skills in the minds of the students, and exposing recent developments in computer science and engineering like SMAC technology (Social network analysis, Mobile computing, Analytics and Cloud computing) and Machine Learning. Also, through the students' association, workshop and conference, the students are motivated to develop organizational and leadership skills apart from mastering technical skills. Our experienced and dedicated faculty encourage the learning habits of the students inside an outside the class room as well as towards self learning. Our aim is to provide technical and soft skills to our students in getting placements in reputed national and international organization; and also, we have entrepreneurial skills and make them future business magnets of our country in their chosen field. 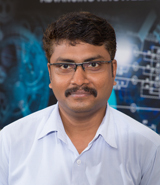 The mission of the Computer Science and Engineering Department is to provide strong theoretical and practical knowledge in design, implementation, and analysis of computational systems along with problem solving and communication skills to understand and effectively solve the problems of the society. The department will identify and ignite the young minds and foster applied research in the field of computer science engineering. An ability to design, implement, and evaluate a computer-based system, process, component, or programme to meet desired needs. Recognition of the need and an ability to engage in continuing professional development. An ability to use the latest techniques, skills, and tools necessary for computing practice. The CSE Association for the academic year 2018-19 was inaugurated on 5th September 2018. 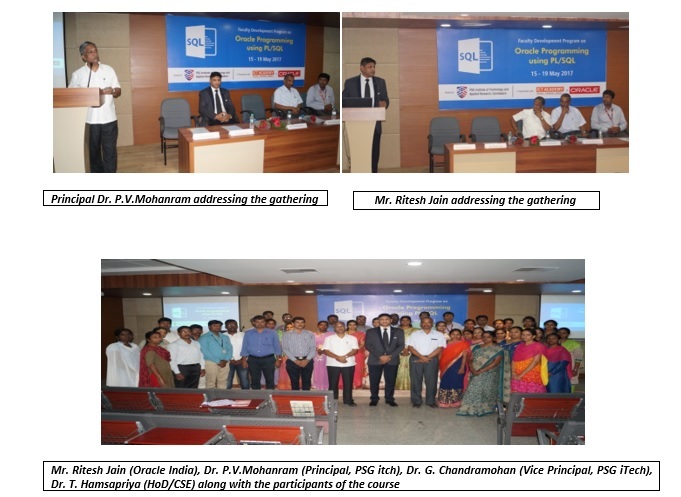 Mr.N.Sundara Ramalingam, Head-Deep Learning practice, NVIDIA Graphics Ltd, Bangalore presided over the function. 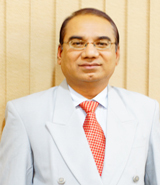 Dr.T.Hamsapriya, Head of the CSE Department welcomed the gathering and inaugurated the association. 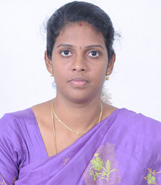 Ms.A.C.Sumathi, Faculty In-charge, CSE Association introduced the Office bearers of the association. 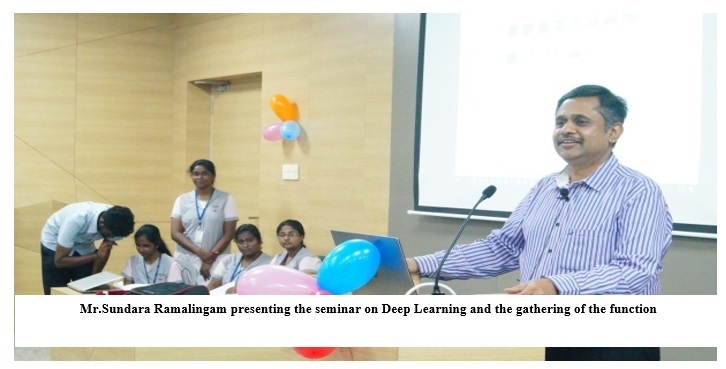 Mr.Sundara Ramalingam, addressed the students and gave an insight to the evolution of deep learning from Artificial Intelligence and Machine learning. He elaborated on deep learning and its applications. Also, he gave an exposure on NVIDIA GPUs and its capabilities. The session was very interactive and ended with question and answer session on deep learning and its current trends. A quarterly newsletter "Bits n Bytes" was released on this occasion. Computer Science and Engineering Association (CSEA) valedictory is conducted on April 6th 2017 in CSE Seminar Hall at 3.30 to 4.30 PM. The programme starts with Welcome note by Mr.Yogesh, Joint Treasurer. He welcomed Shri.M.Karthik, Deputy Manager, ICT Academy, Govt. of India and all the students and Faculty members for their presence. Also he welcomed Mr.Vishunu Sanjay ,Event Coordinator ,ICT Academy for the valedictory function. 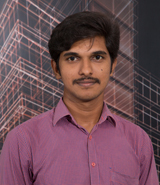 Next Mr.S.Karthikeyan, Faculty Coordinator, Computer Science and Engineering Association (CSEA) he read the Computer Science and Engineering Association (CSEA) annual report for the academic year 2016-2017.and also he motivated the students to do more in next academic year like coding contest, various competitions, Workshop, Quiz, project expo etc. 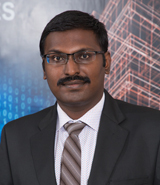 Next Shri.M.Karthik, Deputy Manager, ICT Academy, Govt. of India, Chief Guest addressed the gathering and he delivered a Guest Lecture on "Virtualization & Data Science" for our young students. He talked about Cloud, Hadoop, Data analytics & Data Science and various industry perspectives and their expectations to students. Also students interacted about software and product based company's expectations and virtualization etc.Also the chief guest gave the Case prize for the project winners Mr.J.R.Hari Nanda & Mr.Krishna Prasad of III CSE for their project demonstration in project expo. Mr.Vishnu Sanjay Event Coordinator explain about VMware Virtualization and cloud and data science courses under ICT academy to the students. Finally Ms.Shanma, Joint Treasurer delivered the Vote of thanks. she thanked Management, Principal, Vice Principal, Head of the department, faculty coordinator and others staffs & students for their support and encouragement. The inauguration of the Computer Science and Engineering Association (CSEA) for the academic year 2016-17 was held on 11-07-2015 at the CSE seminar hall. Mr. Chiranjeev Brahma, the Country Manager of SAP University alliances graced the occasion as the chief guest. O.Lokeshwar (3rd year CSE), the Secretary of the Association welcomed the dignitaries. 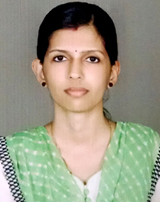 Ms.Sowndarya (II year CSE), the President of the association introduced the office bearers of the association. She highlighted the skilful and persistent role of the association in developing both academic and extracurricular skills of the students. 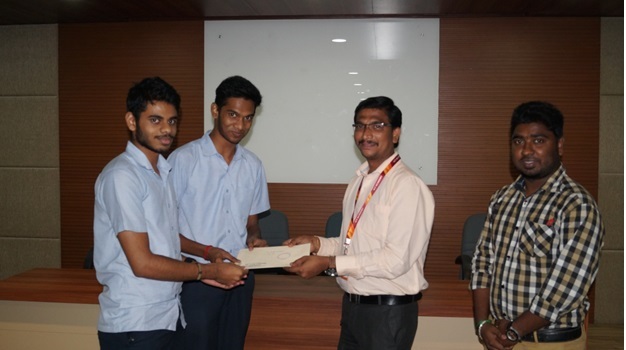 Mr.T.Yogesh (2nd year CSE), the Treasurer of the association introduced the chief guest to the students. Mr.Chiranjeev Brahma, Country Manager for SAP University Alliances India is driving academic engagements focused at students to build a pipeline of talented college graduates for SAP’s ecosystem. It shall help the students to meet the demands of the Digital Enterprise. He has conducted an activity “Code for Charity” a 30 hour hackathon where the participants developed apps to solve specific problems put forward by the NGOs. Chiranjeev Brahma being inspired with a huge mass of youth starving for knowledge in front of him delivered a guest lecture on “Digital Transformations”. He explained about the age of digital enterprises and how it has influenced every aspect of life. With great pride, he explained how SAP innovations help 310,000 customers worldwide work together more efficiently and use business insight more effectively. SAP reacts quickly to changes in technology and capitalizes on market opportunities before they disappear. SAP’s vision is to help the world run better and improve people’s lives. In the process of showing light on few technological innovations in SAP he touched upon the following trends. SAP’s HANA Cloud Platform is an in-memory platform that runs analytics applications smarter, business processes faster, and data infrastructures simpler. It provides SAP’s “Platform as a service” for developing modern cloud based business applications. “SAP Mobile Platform” delivers user-centric mobile apps rapidly and cost-effectively with the industry’s leading mobile application development platform. It accelerates the development and delivery of secure, highly scalable business and consumer applications to any mobile device. “SAP Enterprise Portal” helps business work better and faster with integrated, role-based enterprise portal software. It reduces IT costs through fast, affordable integration of SAP and non-SAP resources. “SAP Gateway” is a technology that provides a simple way to connect devices, environments and platforms to SAP software based on the current market standards. “SAP Business Process Automation” application by Redwood connects people, applications, and software systems to help you manage process execution effectively. Business stakeholders of SAP gain more visibility in their business processes and get control of processes, increasing efficiency, enhancing reliability, and reducing costs. In addition, SAP has built applications catering to the needs of the following domains: Aero space and defence, banking, chemical, consumer products, pets, cosmetics, engineering constructions. 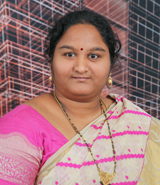 Ms. S Shanmaa of 2nd year CSE, Joint secretary of the association delivered the vote of thanks. 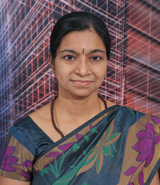 The Inauguration of Computer Science and Engineering Association was held on 20/01/2015. 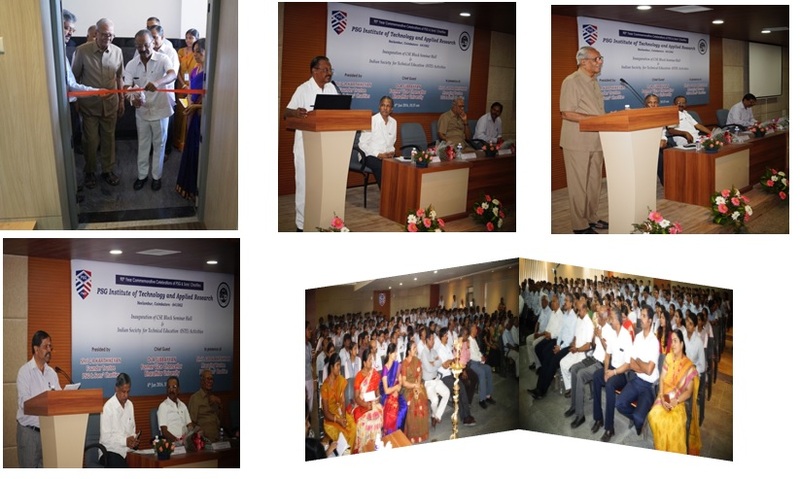 Mr.Vinaytheerthan, Chief Manager and Mr.Sankaranarayanan, Regional IT Head, from Central Bank of India, Peelamedu, were invited as chief guests. Principal welcomed the chief guests and Dr A Muthukumar, HoD/CSE gave the presidential address. 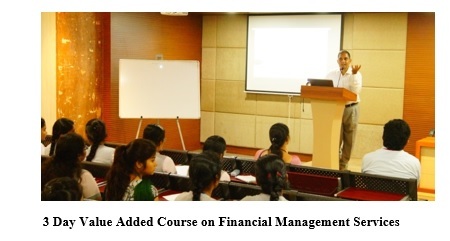 Mr. Sankaranarayanan delivered a lecture on various important features of banking software. Android, an open source and Linux-based operating system, is used for mobile devices such as smart phones and tablet computers. 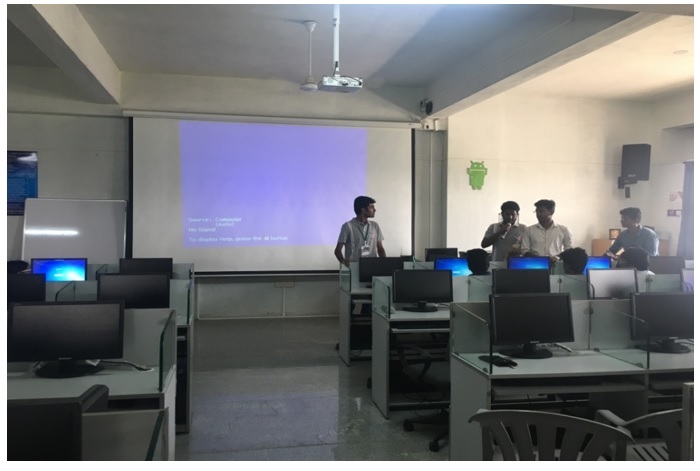 A five day Course on “Android Programming” was conducted for the students to help them formulate solutions to well-defined problems, implement the logic in Java and get trained in the basic skills in Android Studio to implement the Android application. The entire course was divided into 5 days. 50 students from II CSE were the beneficiaries and were trained by Mr. Raghavendra and Mr. Rakesh of Starworks Technologies Pvt. Ltd., Bangalore. The Value Added Course on Software Testing facilitated the participants to understand the business, user and functional requirements, write and review the test scenarios and test case design, identify the defects in the early stage of testing and prepare the test summary report. The total number of participants for the course was 56 from CSE, ECE and EEE. The Value Added Course aimed to develop the proficiency in the areas like exploring the various components of web page, designing a webpage using a basic editor tool, applying special styles to the elements of a webpage and employing a higher end software for webpage development. 48 students attended the course. Mr. Mani Varadhan, CEO, Plexus Networks, Bangalore delivered a Guest lecture on "Open Source Technologies" at CSE seminar Hall on 8th October 2018. He discussed various issues and the need for the Open Source Technologies. 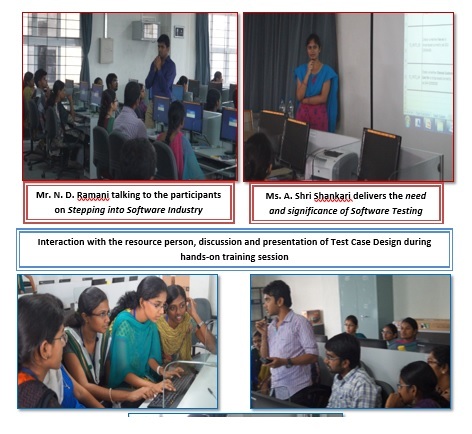 The session was very interactive and the students of the Department of CSE had a thorough perspective on Open Source Technologies and their current real world applications. 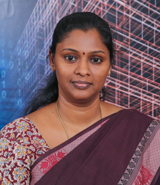 The Department of Computer Science and Engineering has organized a CISCO© Certified Network Associate (CCNA) Course for the benefit of PSG Polytechnic College Students, studying Diploma in Computer Networking. The course spanning 60 hours covered module 1 & 2 from the CISCO© curriculum. The Course was offered in association with CISCO© Networking Academy under the guidance of PSG Non-formal and Continuing Education (PSG CNCE). 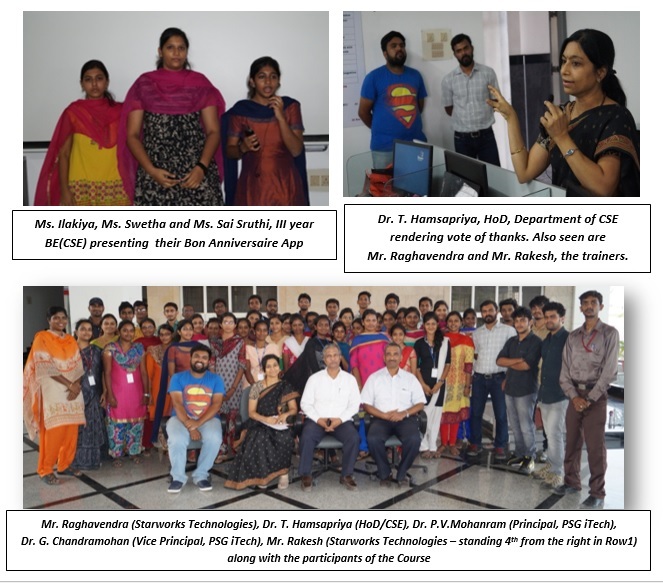 A Guest lecture was organized by the CSE Department Association on 3rd April 2018 at PSG Institute of Technology and Applied Research, Neelambur, Coimbatore. Dr. T. Hamsapriya, Head of the CSE Department welcomed the gathering and introduced the resource person Dr. Rogers Jeffrey, Dept of CSE, University of Wisconsin-Madison. Department of Computer Science and Engineering in association with Institution of Engineers and Centre for Non-formal and Continuing Education conducted a fast track course on "Data Science with Machine Learning" during February and March 2018. Students and faculty, both internal and external participants were trained and certificates were given. Out of 55 participants, 48 were students and 7 were faculty. The Department of Computer Science and Engineering, PSG iTech along with ICT Academy organized a two days 24 hours non-stop Student Championship 2018 (Learnathon) from 2nd Feb 2018 to 3rd Feb 2018. Around 132 students from second and third year CSE actively participated in the Learnathon. 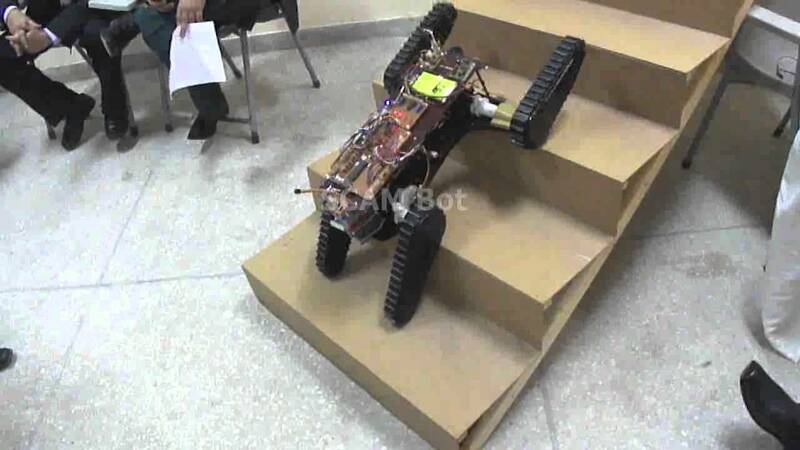 The students were eager about the self-learning process and they worked as teams to learn new concepts. 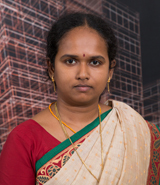 PSG Institute of Technology And Applied Research turned out to be an Active Contributors for the Learnathon Event. The top three students were given prizes for their achievement. 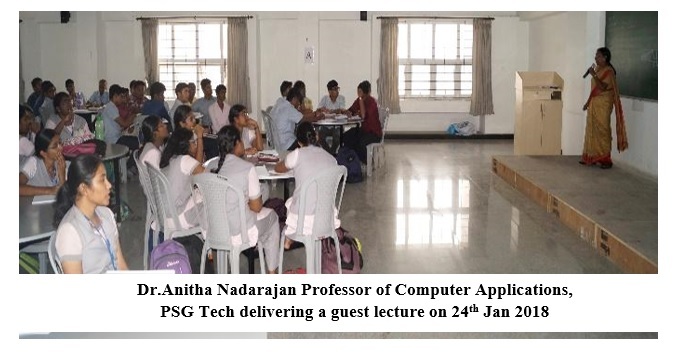 A Guest lecture was organized by the CSE department on 24th January 2018 at PSG Institute of Technology and Applied Research. 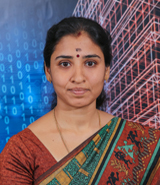 Dr.T.Hamsapriya, Head of the CSE Department welcomed the gathering and introduced the resource person Dr.Anitha Nadarajan, Professor of Computer Applications, PSG Tech. A Guest lecture was organized by the CSE department Association on 11th October 2017. Dr.T.Hamsapriya, Head of the CSE Department welcomed the gathering and introduced the resource person, Dr.P.Ilango, Professor, School of Computer Science and Engineering, VIT University, Vellore. 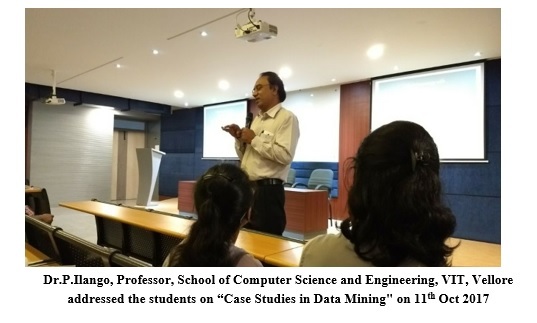 Dr.P.Ilango addressed the students and delivered a Guest lecture on "Case Studies in Data Mining". A Special lecture on Team Work for Preparations was conducted for the II BE CSE students on 8.8.2017. 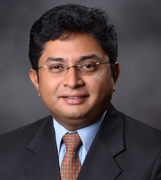 In his lecture, Mr. Saravana Prabhu, SQC Lead, KLA Tencor Software India Pvt. Ltd. Chennai, asked the participants to identify their dream company. He projected a glimpse of video from the film "English Vinglish" to show how continuous preparation leads a person to achieve the goal in life. 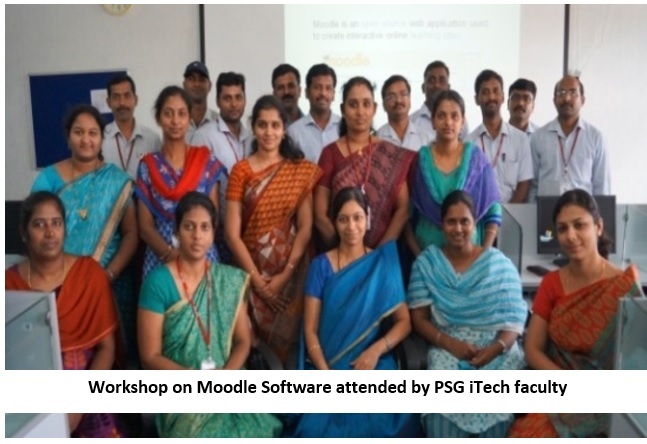 Inauguration of One day Workshop on "Effective use of Moodle 3.5" by Dr. B Ramamoorthy, Advisor (Academics), PSG Institutions on 21st June 2018. Forty-six faculty members participated in the programme. 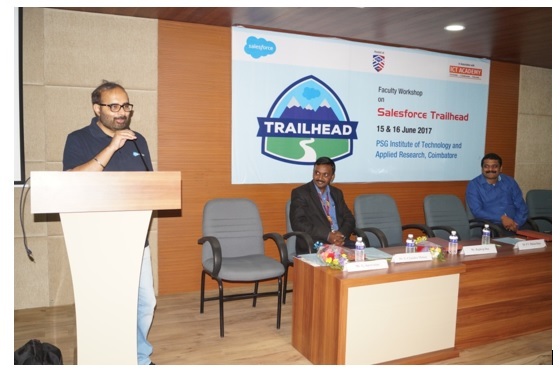 The Department of Computer Science and Engineering, PSG Institute of Technology and Applied Research along with ICT Academy organized a two day Faculty Workshop on "Salesforce Trailhead" from 15th June 2017 to 16th June 2017. 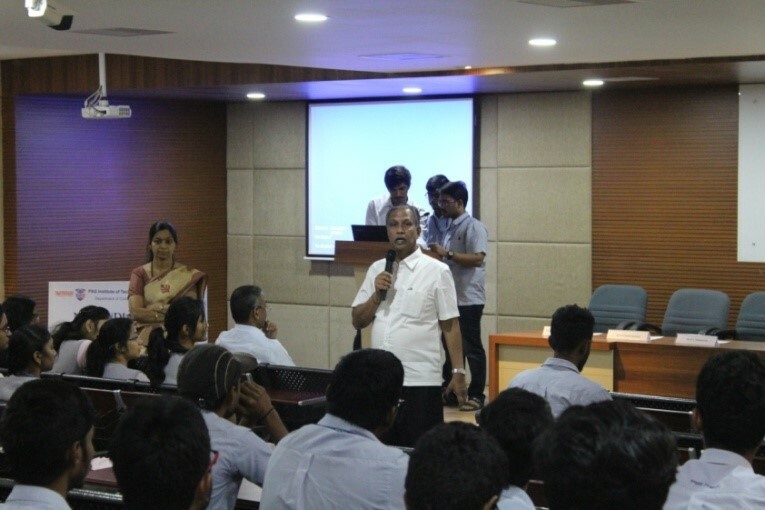 There were 92 participants from various colleges which included 6 participants from PSGiTech, and 2 participants from colleges outside Tamil Nadu and were trained by Mr. Harish and Team, from Salesforce. The Department of Computer Science and Engineering, PSG Institute of Technology and Applied Research along with ICT Academy organized a five day FDP on "Oracle Programming using PL/SQL" from 15th May 2017 to 19th May 2017. There were 39 participants from various colleges which included 5 participants from PSGiTech, and 5 participants from colleges outside Tamil Nadu and were trained by Mr. Ritesh Jain, Project Manager, Ebiz Suite Practices, Oracle India Development Centre, New Delhi. The workshop focused on Android Application Development using Android Studio Software. 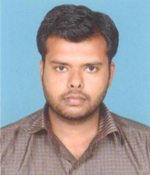 The fundamentals of Android development was handled by Mr.V.Nikeshh, II year BE CSE Student. Application development with programming features sessions were handled by Mr.J.R. Hari Nandha and Mr.A. 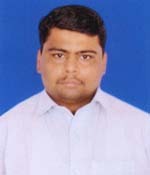 S. Krishna Prasad of III year BE CSE. A two-day workshop on Internet of Things was organized on 29th and 30th of July, 2016 for II year CSE students. 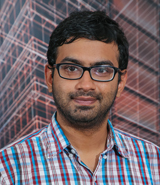 The resource persons are Mr.Jaideep Rao and Mr.Vinay of SAP Labs, Bangalore. The workshop began with an interactive introductory session on "Internet of Things" on 29th July 2016. Mr.Jaideep Rao asked the students to give their own definition on IOT in a single word. 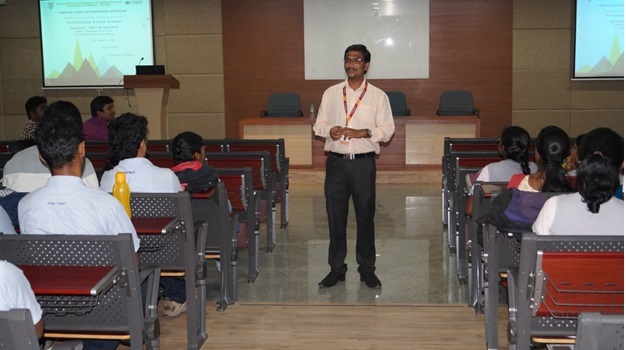 After getting a huge response from the students, he compiled all ideas together to give SAP's own definition of IOT. He further explained how SAP implements IOT in managing huge volume of data to aid SAP's customers transform their businesses. 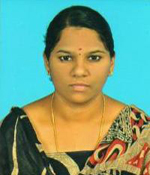 A Two-Day Workshop on “The Fundamentals of Data Analysis, Analytics and All That Jazz!” for young Teacher-Researchers, Research Scholars and PG Students on 12th and 13th February 2016 was organized jointly by PSG Institute of Technology and Applied Research, Coimbatore and Sree Saraswathi Thyagaraja College, Pollachi with the professional support of “The Computer Society of India (Coimbatore Chapter) and IEEE Computer Society (Madras Chapter)”. A hands-on workshop on "Moodle Usage" was conducted by the department of Computer Science and Engineering on 1.12.2015 to the faculty members of EEE, ECE, Civil Engineering and Mechanical Engineering department. Moodle (Modular Object-Oriented Dynamic Learning Environment) is an open source learning management system. Dr. T. Hamsapriya, HoD-CSE illustrated the effective use of Moodle and ways of developing online interactive quizzes and assignments. 20 faculty members were benefitted by this programme. On 10th August 2018, 51 students of III BE CSE along with two faculty members Ms. G. Niranjani, Assistant Professor and Dr. R. Ravi Kumar, Assistant Professor visited "THE HINDU" Publishing House, Mangalore. Mr. Rajesh Kumar, Senior Engineer-Printing, THG Publishing House welcomed and guided to visit the printing division. 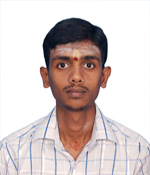 He said that the news will be sent to that company as a pdf fomat file from Bangalore office. A two day industrial visit to Trivandrum and Cochin on the 19th, 20th of August (Friday, Saturday). A two day industrial visit was organized for the 50 students, to Trivandrum and Cochin on the 19th, 20th of August (Friday, Saturday). On the first day, the students visited 'Keltron' in Trivandrum. On the second day, the students visited 'Focuz InfoTech' located in Cochin. 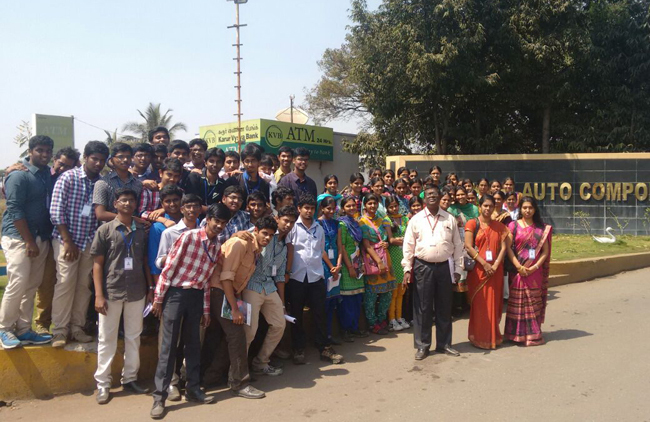 A three-day industrial visit was organized for the II year B.E CSE students to Bangalore and Mysore on the 26th, 27th, and the 28th of February (Friday, Saturday and Sunday). 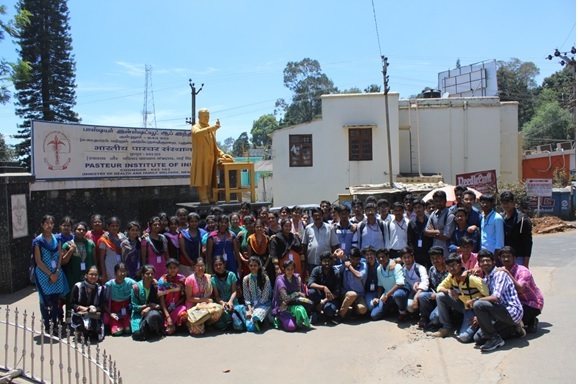 The students visited SAP Labs, 7 Inc. in Bangalore and Infosys Technologies Ltd, Mysore. Industrial Visit to Sakthi Auto Components Ltd.